these tables are quick and easy to put up and with next day delivery cannot be beaten when needing replacement fast. Please can you tell me if the top of the table has a edge on it to stop items rolling off the table? Unfortunately, this does not have an edge. Designed with the expertise of our care home clients, our Overbed Easy Tilt Table with Wheels is suitable for use with both beds and chairs. It has been finished with a melamine wood effect that wipes clean and soft to the touch. Designed to angle according to the needs of the user, it is large enough to use during meal time, for leisure activities like jigsaw puzzles or to hold a book when not in use. It has been fitted with height and angle adjustment buttons with easy-grip knobs and the ability alter up to 40cm in total. 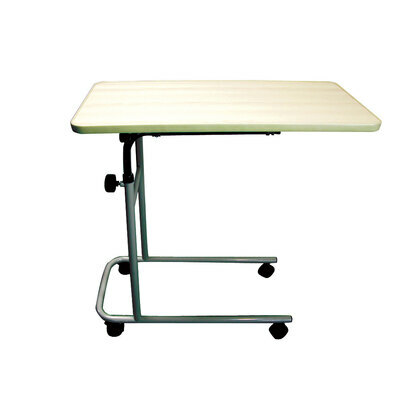 For peace of mind, 4 lockable castors can be used to fix the table in place once it has been adjusted with the tilt table able to support up to 5kg in weight at any given time. Here at Gompels, we have a wide range of Bed Accessories designed to provide confidence including our Bedside Wedges and our Slide Sheet. All our items are available here online and at exceptional wholesale prices.